Check out the latest features and updates in SOLitrack v2.2! Would you like to know exactly where a job is in the production lifecycle? Need to oversee operations from your facilities from the palm of your hand? No problem. SOLitrack is like a GPS system for your documents. 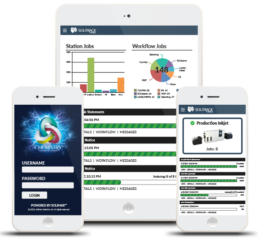 It tracks job statuses and current conditions of any and all of your production print workflows. This information can be delivered to your mobile device through SOLitrack Mobile – a customizable web interface. Easily manage your SLA and priority schedules, track job status and monitor printers and other devices. With a preference-based alert and notification system along with custom reporting, SOLitrack Mobile can keep you in the know while you’re on the go! Job Management at Your Fingertips, Anywhere, Anytime! * A USB hub device can be used to increase the number of USB ports. USB ports are not required for any products using machine validation licensing.